Discover the first major French retrospective devoted to Victor Vasarely. This exhibition reveals Vasarely’s ‘software’, which holds a dual dimension. As the heir of the historical avant-gardists of the early half of the 20th century, in particular Bauhaus, Victor Vasarely launched into a radical undertaking to secularise art. In other words, he was committed to defining ways of designing and producing which would enable widespread social distribution of art. At the same time, and this is the other major aspect of his work, Vasarely developed forms which caught the eye to a further degree than abstract painting in general and thus marked history as the inventor of kinetic art. The exhibition invites you to discover each of these aspects and how they are linked. Some twenty paintings, some from private collections and exhibited here for the first time in more than fifty years, demonstrate the uniqueness of Vasarely’s brand of abstraction in the late 1940s. This abstraction is based on the observation of reality, nature and architecture. Particular emphasis is placed on a dozen paintings in the Gordes-Cristal series. In 1948, the artist visited Gordes for the first time, and under the Provence sun, he made a decisive discovery for the development of his work, i.e. the angular geometry of the site and the powerful contrasts of shadow and light which provoked optical illusions and destabilised vision. Crystal, with its complex effects of reflection, transparency and blurred planes, became a model for his abstraction. The instability of these crystalline forms, the first explorations of an elementary visual language and the desire to bring movement to inert forms of abstraction combined to pave the way for the impressive aesthetic revolution which was to be the birth of optical-kinetic art in the mid-1950s, renamed Op Art in the following decade. By reducing his language to black and white, Vasarely thus defined a vocabulary which transports the eye to the dynamic world of waves and particles. The exhibition presents some major works which seem to vibrate or flash. In these works, a shape captured by the eye is endlessly transformed in other shapes. In pursuit of the ideal of a socialisation of art, a notion he inherited from the avant-gardists, and as a witness of the strictly Warholian understanding of media, in the late 1960s Vasarely undertook the widespread distribution of his forms and achieved, unusually, the acclaim of popular culture. The secularisation of art took several routes. Firstly, that of the multiple (in particular mass-printed posters) and secondly, applied arts. The artist therefore found a way to ensure the existence of his work outside of the institutional framework of Art. One of the characteristics of this exhibition is to highlight the amazing success of his work in the post-war boom as of 1965 and throughout the following decade. 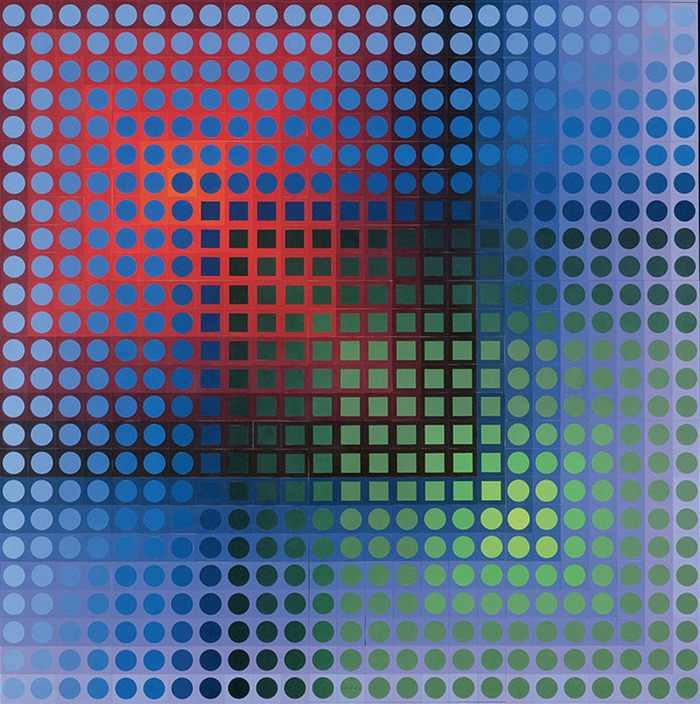 Vasarely’s work was to be found in fashion publications, on book and magazine covers, album covers (such as David Bowie’s Space Oddity), on television and in films (from Erotissimo to Fear over the City). The visual popular culture of the time genuinely took to Vasarely's art form. The ambition of a social, secular art which accompanied the development of the ‘plastic unit’ found a logical opening in the creation of architectural integrations. In 1954, the project for the University of Caracas provided Vasarely with his first opportunity to put his ideas on the integration of art in architecture into practice, alongside Arp, Calder and Léger. Some of the artist’s most famous integrations were created in the early 1970s, such as the new Montparnasse station building, the facade of the RTL radio building in Paris, or the dining hall of the Deutsche Bundesbank in Frankfurt, recreated in the exhibition at the Centre Pompidou. 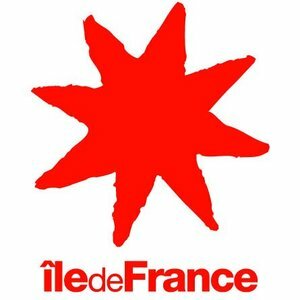 These integrations are presented in slideshows, including one devoted to the astonishing Architectonic Centre inaugurated in Aix-en-Provence in 1976. Vasarely came to believe that it was through architecture that his forms could be applied the most effectively.